On his own 48th birthday, US President Barack Obama turned the spotlight on a reporter also celebrating her special day. 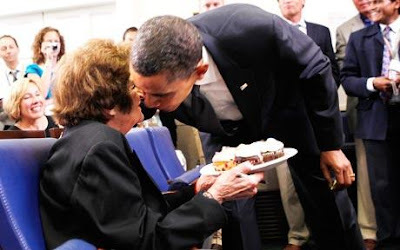 Mr Obama sang "Happy Birthday" and presented Helen Thomas, the doyenne of the White House press corps, with cupcakes and a single candle to celebrate her 89th birthday, before planting a kiss on her cheek. The outspoken Thomas, who has covered every president since John F Kennedy, spoke quietly to Mr Obama, who ignored reporters' shouted questions about his own birthday and ex-president Bill Clinton's mercy mission to North Korea. "Helen wished for world peace, (and) no prejudice, but she and I also had a common birthday wish," Mr Obama said. "She said she wishes for a health care reform bill," Mr Obama said, referring to his signature domestic reform legislation, working its tortuous way through Congress. Thomas, a former UPI wire service reporter who now works for Hearst Newspapers, has a place of honour in the front row of the White House briefing room, and first worked the White House beat in 1961. 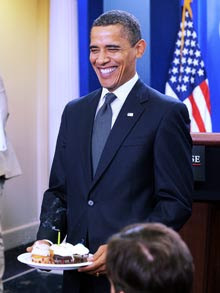 Mr Obama celebrated his own birthday by largely avoiding reporters, and holding a lunchtime meeting with a 57 of the 60 Democratic senators and independents who largely control the fact of his domestic agenda in Congress. White House spokesman Robert Gibbs said that Mr Obama celebrated his birthday at the weekend with a trip to the Camp David presidential retreat surrounded by family and friends. The president indulged his passion for basketball, and even had a game of tenpin bowling – scoring a 144 – a much better showing than his widely ridiculed attempt to bowl during an embarrassing 2008 campaign photo-op.